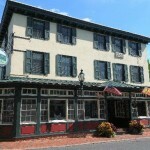 This 1878 inn, named after Josiah Wedgwood (of the china), is said to be haunted by the ghosts of Joseph Pickett and of a little girl named Sarah. A point of historic interest is that George Washington and his men camped on this land during the American Revolution, shortly before his famous crossing of the Delaware. When I had stayed there with my boyfriend (now husband), I felt that even though the Inn was virtually empty, we were not alone. Even the guest book in our room had stories of prior guests feeling that the Inn was haunted, particularly the room we were staying in. It wasn’t an ominous or dreadful feeling, but rather the feeling of not being alone. We stayed in room H. My husband awoke to what sound like marbles being rolled across the sitting room floor. After the 3rd time, something hit the bed frame with a loud crack, like something was thrown at it. The room diary is filled with stories. 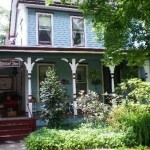 Excellent place to stay, wonderful atmosphere, friendly inn keepers. I stayed here a few years ago. In the middle of the night I saw an older gentleman walking towards me. I know I was awake, it was not a dream. The man was glowing, big white beard, he was wearing a red plaid shirt with ripped jeans. I believe he was walking with a cane. I covered my head for the rest of the night until morning. Least to say I was very tired the next day, but I still believe what I saw to the end of me. I just stayed here and I heard a woman talking (muffled) in the Hideaway Room (private and last room in house upstairs in attic) while we slept. Then upon departing next morning and heading down the stairs from the second floor, I caught a glimpse of a person adjacent to stairs (so floating next to staircase). 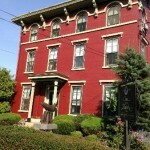 My husband and I stayed at the Inn several years ago. Our room was the lovely lilac-colored room on the second floor. One morning I woke up very early and decided to go down to the dining room to make a cup of tea in an alcove off the dining area reserved for that purpose.re As I stood waiting for my tea to brew, I heard what I initially thought was the wood floor rebounding following my crossing. However when the floor creaked in perfect, rhythmic sequence from the threshold to where I was standing, I thought. “wow, what a surprising phenomena.” Out of curiosity I opened the door on the other side of the alcove and saw it was the inn’s kitchen. Later we found out that the lilac room was the most haunted of the inn’s rooms. And we had been unaware the inn was even haunted until after my experience. I never reported the incident to staff because we left shortly after. I have heard a maid is reputed to be one of the ghosts which would make sense; An early riser, she would have had to hustle down to the kitchen.